Do you ever just want to wipe the slate clean and start from scratch? I do, especially when it comes to home decor. Like me, I’m sure you all have collected various pieces throughout the years vs creating a room all in one fell swoop. I always tend to lean towards more traditional, classic looks at home, but lately I’ve been craving color. Lots of it! With my current pieces, adding this amount of color just wouldn’t work – it’d look seriously out of place. So while I can’t currently obtain and utilize these pieces in my own home (right now anyway), I wanted to share my favorite brights with you! 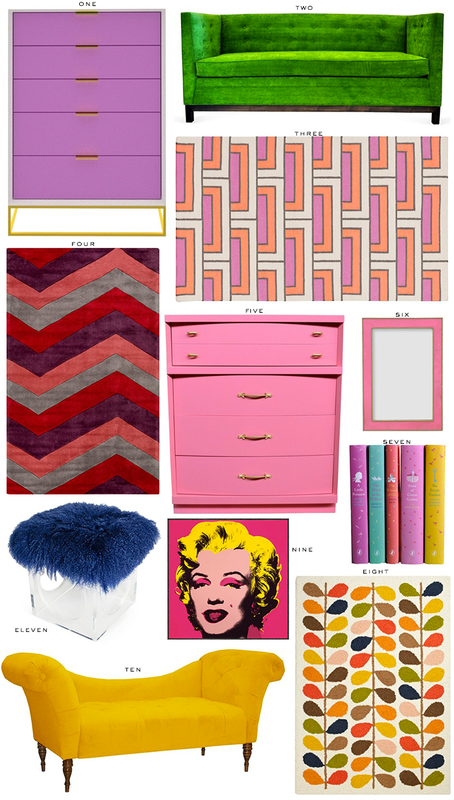 A few to note: this kelly green velvet sofa, this perfectly pink dresser, and this contemporary wool rug. Gorgeous! Shop all the pieces below. WOW. That yellow couch is a statement – and I’m LOVING it. I really need to invest in some really great colorful pieces for my place! Decorating is hard! Like you, my styles change so often and I keep wanting to re-do! So bright and fun! I really like both rugs and the lilac chest.